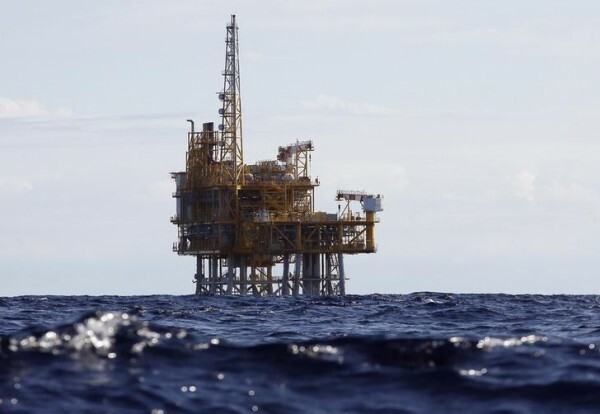 Crude oil prices fell by 2% on Tuesday as investors continued to fret about the lingering oversupply, which is showing no sign of easing despite 6 months of output restrictions by major producers. The recovery in prices from the 2014-15 downtrend stalled in January when they peaked at 1½-year highs. WTI crude has since fallen by 22% from $55.24 on January 3 to a 7-month low of $42.75 a barrel yesterday. Brent crude is also down sharply, declining from $58.37 to $45.42 a barrel. Both benchmarks now stand significantly below their 200-day moving average, while the 50-day moving average has widened its bearish gap. This could be a sign of a new longer-term bear market, having emerged from its last one only a year ago. In May, OPEC and some non-OPEC countries including Russia, agreed to extend last December’s output deal to cap production by a further nine months until the end of March 2018. The initial agreement was for six months, starting in January 2017, but was extended after failing to have a major impact on reducing global inventories, which remain near record levels. The main reason for the ineffectiveness of the output deal in reducing the supply glut is rising production elsewhere. US output has recovered sharply since the middle of 2016 as US shale producers have successfully managed to cut costs and consolidate following the downturn when many were forced out of the industry. The number of active oil rigs in the United States now stands at a two-year high of 747 according to data from Baker Hughes. But the US isn’t the only major producer that’s seeing output rise. Libya and Nigeria, even though both are OPEC members, were exempted from the output deal due to the disruptions they experienced to their production from regional conflicts. However, as those disruptions have now ended, Libya looks set to ramp up its output to 1 million barrels a day in the coming weeks and Nigeria has resumed exports from its Forcados pipeline terminal. 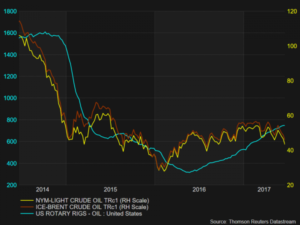 While cheaper oil is good news for consumers, another big slump in oil prices has ramifications for both equity and currency markets. Energy stocks have already taken a knock from the latest plunge and an extended downslide could hurt the overall positive risk sentiment currently being enjoyed by equity markets around the world. In forex markets, oil-linked currencies such as the Canadian dollar and Norwegian krone have come under pressure from yesterday’s losses in oil prices, though so far the impact is limited. The US dollar is up 0.6% against its Canadian counterpart in the past two days and is eyeing the 1.33 level for the first time in a week. Against the Norwegian krone, the dollar has made more substantial gains, rising by 3% since the end of May. However, a bigger concern for investors is the possible impact of a sustained fall in energy prices on monetary policy. Central banks around the world have just breathed a sigh of relief after eliminating the threat of deflation. A renewed risk of deflationary pressures could force major central banks such as the Federal Reserve to halt or even reverse its current cycle of gradual rate increases. Traders already responded to the possibility of lower inflation, and therefore lower interest rates as a result of the latest rout in oil prices, by buying US treasury notes. The yield on 10-year US treasuries slid back for a second day today towards last week’s 7-month low of 2.103%.